The Windows Store included with Windows 10 could be a one stop shop to find all the software you’re looking for. But it isn’t. A few desktop applications, like Kodi and Evernote, are now available–but most aren’t. The Store primarily offers mobile-style apps like Candy Crush Saga and TripAdvisor–two applications that Microsoft is now bundling with Windows 10–but not the more powerful desktop apps many Windows users depend on. At least the Store isn’t full of fake desktop apps anymore. Microsoft decided to only offer universal apps, and not desktop applications, through the Store. The Windows Store only includes apps written for Microsoft’s new “Universal Windows Platform,” or UWP. It’s also sometimes called the “universal application platform,” or UAP. 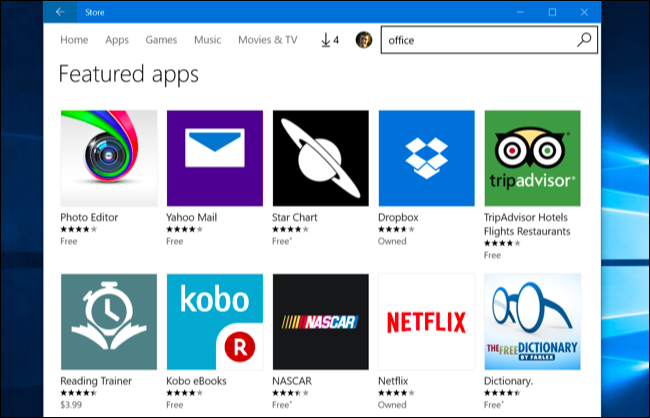 Back in the Windows 8 and 8.1 days, the Store only included those new “Metro apps” or “Modern apps”–which Microsoft actually called “Store apps” in Windows 8.1. Those apps were more limited than desktop apps, only running in the full-screen Metro interface, and never truly “closing”. It was simple: If you wanted applications for the new interface, you used the Store. If you wanted desktop applications, you got them the old-fashioned way. However, in Windows 10, Microsoft has begun blurring the lines. Those Store apps run in their own windows on the desktop, alongside other desktop applications. However, they’re still not the same. With the release of Windows 8, Microsoft made it possible for developers to add their desktop applications to the Windows Store. However, these were just Store pages that provided links to websites where you could download desktop apps. These no longer appear to be present in Windows 10. 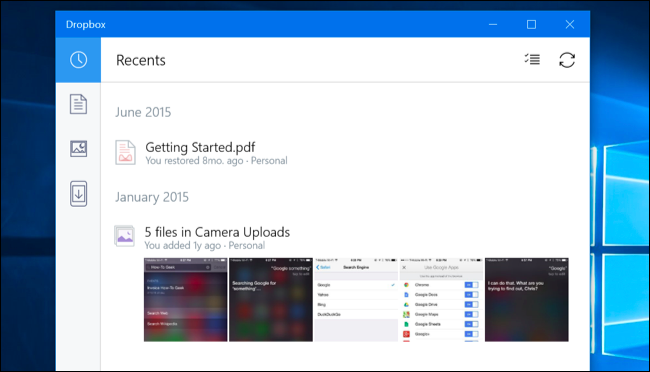 But Microsoft’s new universal application platform is more limited. Even in cases where powerful desktop-style applications have been brought to the Windows Store, the Store version is hamstrung compared to its desktop counterpart. Just take a look at Rise of the Tomb Raider, which is available both from Steam as a desktop app and the Windows Store as a universal app. The universal version is much more limited. There’s a Dropbox app in the Windows Store, but it can’t sync your files to your computer like the Dropbox desktop application–it’s more similar to Dropbox’s smartphone apps. That’s because Microsoft’s new application platform is designed to be more limited. Apps are run in a sandbox, limiting the files they can access on your system. They can’t interfere with other apps and snoop on you. They can’t launch themselves at startup or constantly run in the background. Universal apps are designed to be portable and run on Windows Phone, Xbox, and other platforms. These new universal apps have more in common with mobile apps on iPhone, iPad, or Android than they do with traditional desktop apps. In contrast, traditional Windows desktop apps can do practically anything they want with your computer. UAC now prevents them from mucking with your system files without your permission, but they can still tamper with your personal files, function as keyloggers, or make your system unstable. The power is a double-edged sword. Microsoft would like to only distribute safe apps that aren’t a security, privacy, or performance risk. That’s why it excludes normal desktop apps, which it can’t guarantee won’t cause problems. Microsoft would prefer if people created universal apps and distributed them through the Store, as the system can manage these apps and ensure a better experience. That’s the idea, at least. In reality, universal apps still haven’t really taken off and most Windows users need desktop applications. But, three and a half years after the Windows Store was first released with Windows 8, Microsoft is still trying to change that. Macs actually have a similar problem. While Apple’s Mac App Store includes traditional Mac desktop apps, the Mac App Store enforces sandboxing to prevent these apps from causing trouble on Macs. This means that more powerful Mac applications can’t be provided through the Mac App Store and have to be downloaded from websites like you’d download a Windows desktop program, and that the applications in the Mac App Store are often more limited versions. Many Mac developers have abandoned the Mac App Store. Mac users can’t find all the desktop programs they want in the Mac App Store, either. With the Anniversary Update for Windows 10, Microsoft’s “Desktop Bridge”–previously known as “Project Centennial”–has arrived. Developers can now take traditional Windows desktop applications (in other words, Win32 and .NET apps) and package them into a UWP apps that can be submitted to the Windows Store. This technology works surprisingly well. The developers of the Kodi media center have written that they didn’t believe it would be easy for Kodi–a complex application that uses hardware audio and video acceleration–to become a UWP app. But, to their surprise, it just worked. 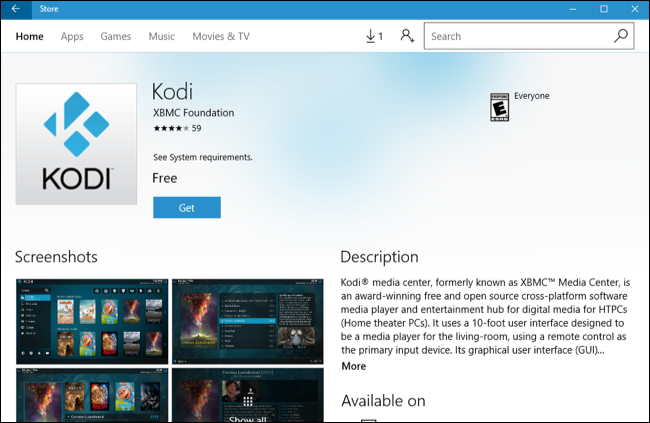 The desktop version of Kodi is now available in the Windows Store. 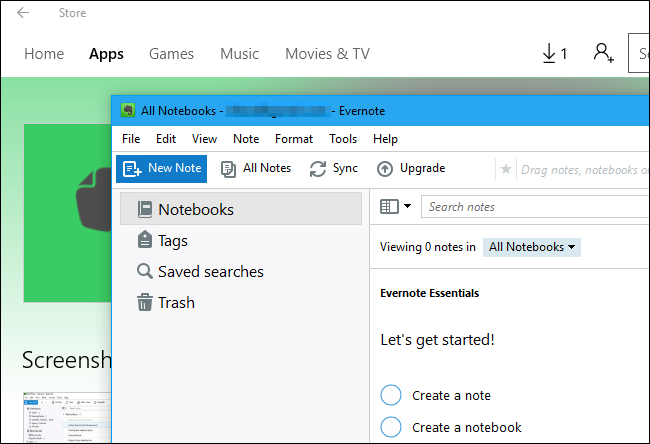 The full desktop version of Evernote is now available in the Windows Store, too. It’s a big improvement from the sad “Evernote Touch” app that was created for Windows 8. But what about the sandboxing? We expected that many applications might not work properly after conversation as they’re limited by the UWP sandbox, just as the Mac App Store sandbox limits many Mac apps. Microsoft even warns developers that not every app will work without modification. However, it looks like the sandbox is very forgiving. Apps packed with the Desktop Bridge aren’t subject to all the sandboxing restrictions enforced on normal UWP apps. This allows many desktop applications to “just work” after they’re converted without any extra tweaks. Apps packaged in this way have some advantages over normal desktop apps. 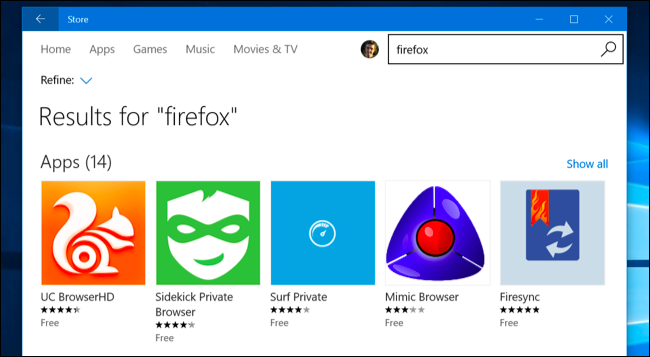 The Windows Store provides a central, safe place to find and install apps from. The Store will automatically update apps, too. The converted apps can be quickly installed and uninstalled in a clean way, without any installation wizards, leftover registry entries, and other unnecessary files taking up space on your hard drive. Developers can also add UWP features to their desktop apps. For example, the Evernote app in the Windows Store offers a live tile. Microsoft says this will let developers gradually migrate their desktop apps to UWP apps, replacing bits of code at a time. Unfortunately, these apps don’t have all the advantages of normal “Universal Windows Platform” apps. While they’re technically “UWP” apps, they’re not actually universal–they will only run on Windows 10 PCs. They won’t run on Windows 10 phones, the Xbox One, HoloLens, or other platforms Microsoft may release in the future. We expect to see more and more desktop apps added to the Windows Store in the future, but not all desktop apps will be available in the Store. Some powerful applications just aren’t capable of being sandboxed. Developers will have to do some extra work, and any extra UWP features will only work on Windows 10. Developers will have to continue offering a downloadable installer for Windows 7 users. And, if a developer is selling software, it will have to give the Windows Store a 30% cut of the profits. Developers may want to sell their own software and keep all the profits rather than sharing them with Microsoft. For the foreseeable future, the Windows Store will continue being just one way to get some applications–not a one stop shop for all the software you might want on a Windows 10 PC.